Construction Loans for Commercial Projects Starting at $5 Million! Procuring large commercial construction loans is extremely difficult, time-consuming, complex, tedious, requires a high-level of expertise and experience, and we absolutely love them! Assets America® is one of very few commercial lenders that has the knowledge and background to arrange substantial commercial construction loans and construction financing. Our loans start at $5 million with virtually no upper limit. One of the distinguishing characteristics of commercial building construction is that the physical building has not yet been constructed, so initially, the full and final collateral does not yet exist. Therefore, the lender makes only partial construction loan disbursements, which of course the lender monitors very carefully. Prior to release of the subsequent construction disbursement, the construction lender will verify that the last disbursement was properly used to cover the intended construction expenses and that all lien waivers have been received. 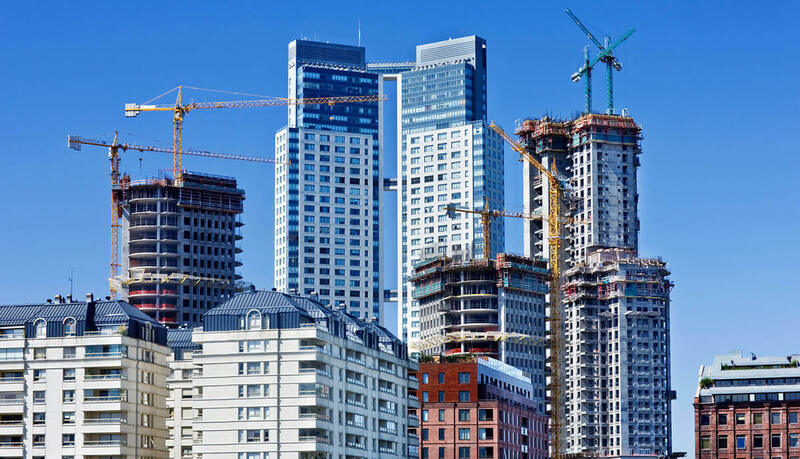 Our construction funding sources consider many factors when underwriting a commercial construction loan, including the developer’s track record, the proposed development’s proforma, and so forth. It takes a high-end brokerage, with literally decades of experience, like Assets America® to handle the extremely detailed and complex documentation needed for approval and funding of high-end commercial construction loans. Different types of commercial construction loans are available for a variety of purposes. Commercial construction loans are used to build new commercial properties and to reconstruct, rehabilitate or upgrade existing commercial properties. If you scroll through the Lines of Business menu items on our website, you’ll see details of the numerous purposes for which commercial construction loans can be used. They include Multifamily Loans, Office Building Loans, Hotel Financing, Hospital Building Loans, Mixed Use Development, Industrial Park Loans, Master Planned Communities Loans, and several more. When you need commercial property loans in excess of $5 million with excellent construction loan interest rates, Assets America® has the professional expertise and network of partners and funding sources to arrange the financing you require. Land Development Loans: These are risky loans in that raw land will only collateralize a small percentage of the value of developed land. Therefore, borrowers will often need to provide additional assets as collateral. Lenders look for developers with solid track records in order to grant this type of loan. Proceeds from the loan can be used to clear land, install infrastructure (i.e., water, sewer, power), subdivide the land, and so forth. Acquisition & Development Loans: These loans cover the cost to purchase and subsequently develop raw or partially developed land. Proceeds can be applied to pay for any improvements necessary before new construction begins. New Construction Loans: These are short-term loans, usually interest only. The term is commonly up to 18 months but can be extended for additional fees. 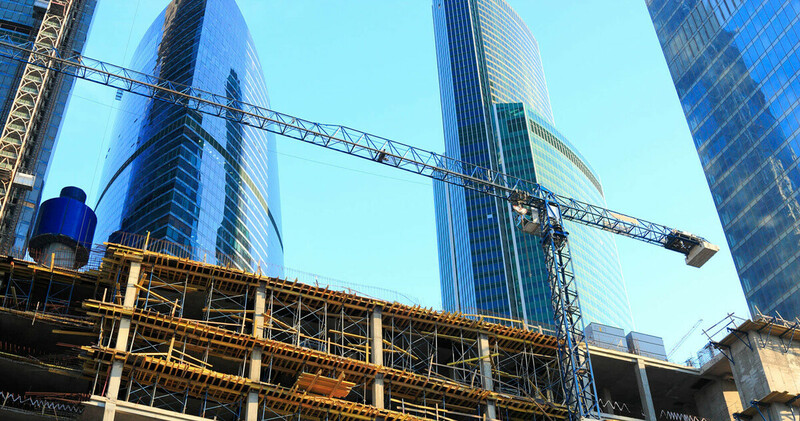 Construction loans can be set up as revolving credit lines to fund separate construction loan stages or separate properties in a multi-phased construction project. Bridge Loans: In some situations, a developer needs construction funding while still owing money on a previous project that is undergoing sale. A bridge loan is designed for this type of circumstance. The loan may require a lien on the property up for sale to act as collateral for the loan. When the construction is rehabilitation rather than new construction, the existing property can also serve as collateral. Bridge loans are also temporary, with terms of usually a year or less, though longer terms can be negotiated. Mini-Perm Loans: Mini-perm loans are temporary loans that typically follow the completion of a construction project and the issuance of a Certificate of Occupancy for the new building. A mini-perm loan settles any remaining balance on a construction loan. It remains in place as the property stabilizes and generates income, usually for a period of two to three years beyond the initial construction loan. Takeout Loans: A takeout loan is a permanent mortgage on a commercial construction project that replaces the relatively short-term financing, such as a mini-perm loan. Assets America® can provide a flow of financing from commercial construction loan through mini-perm loan to takeout loan in a seamless and uninterrupted sequence. Mezzanine Loans: Mezzanine loans are a mechanism to add financing to an existing construction project. It adds debt to the capital stack through subordinated debt that increases the borrower’s leverage. For example, a mezzanine loan might increase the borrowers leverage from a 70% loan-to-cost (“LTC”) to an 85% LTC. Mezzanine loans typically charge higher interest rates and may have additional restrictive terms. Assets America® fully understands the unique characteristics of short-term commercial construction loans, along with their many moving parts and complex deal structures. Our firm understands the needs of both our borrowers and of our funding sources, thus helping us to negotiate the best overall loan terms for our clients. These include the interest rate, the maximum leverage the borrower can obtain, the repayment terms, and many other factors. By loan closing, Assets America® will have negotiated critical understandings, such as property insurance and the construction contract between our developer and our lender. The contract specifies how the developer can draw loan funds, subject to architect’s sign-offs and lien waivers. The contract commits both sides to complete the project, under the terms of the contract. The end goal is the receipt of the Certificate of Occupancy (“CoO”), which satisfies the borrower’s requirement for the last loan installment and the lender’s requirement for sufficient collateral to protect its investment – its only after the CoO is issued, and after the property is leased to stabilization, typically 95% leased, that the property reaches its full liquidation value for purposes of collateral. Banks are typically the primary source of commercial construction loans. They underwrite these loans by examining a large number of data points, including project metrics and the documentation prepared by the borrower (usually through its representative brokerage firm). The lender must weigh a host of factors, including the project’s most current proforma just prior to loan submission, local market conditions, the construction budget, the history of the development team and the financial capacity of the loan guarantors. And of course, any special project-specific risks must also be carefully reviewed and considered. Loan-to-Cost Ratio: The LTC ratio equals the commercial construction loan amount divided by estimated total project cost. Typically, commercial construction loans have an LTC between 70% and 90%. The remainder of the funding comes from the borrower’s equity. Loan-to-Value Ratio: The LTV ratio equals the fully disbursed construction loan amount divided by the estimated value of the property when complete. This value is usually close to 70% but can be higher for SBA-guaranteed loans. Debt Service Coverage Ratio: DSCR equals the proforma net operating income of a proposed property divided by the estimated annual interest and principal payments on the permanent takeout loan (not the commercial construction loan, which is an interest-only loan). Typical DSCR values for commercial construction loans can exceed 1.25. Profit Ratio: The projected profit ratio equals the completed property’s estimated profit divided by the estimated total cost. Lenders typically desire a projected profit ratio of 20% or greater. Lenders requires a decent profit ratio to have confidence that the borrower has sufficient motivation to complete the project. Net Worth to Loan-Size Ratio: This ratio is the developer’s net worth divided by the commercial construction loan amount. Look for a value greater equal to or greater than 1.00, since a lower value would mean the developer had insufficient resources to cover the loan in the event of default. Putting together a loan application for commercial construction financing requires far more than just filling out a form. The borrower, working with its professional representative, needs to assemble and present full documentation, including a business plan, earnings projections, contractor’s estimates and financial documents, for both personal and business. A business plan contains enormous amounts of technical and financial date, including discussions about site location, retail/residential/mixed-use, feasibility studies, building size and number of stories, unit sizes, mechanical plans (plumbing, electrical, ventilation, floor plans, finish standards, etc. ), amenities, parking and signage. If a borrower and lender can come to terms on commercial construction financing terms, a loan agreement will be drawn up and signed, memorializing all of the terms. It will include a disbursement schedule specifying how and when loan funds will be disbursed and available to the borrower, and a discussion of how change orders will be handled. Lenders often require loan-in-balance (LiB) provisions requiring that the unfunded loan is sufficient to cover the costs to complete the project – that is, the loan is in balance. The loan agreement’s LiB provisions will discuss all the hard and soft costs of the project, as well as the project’s allocated equity and secondary loan resources. 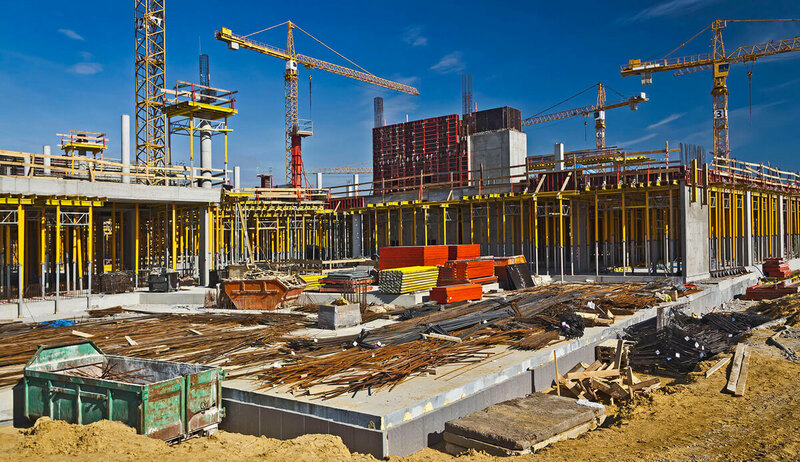 Often, the commercial construction budget includes a contingency account that can be used when costs change in order to maintain the loan’s balance. Change orders are a common contingency that often arise during a commercial construction project. If the commercial construction loan becomes significantly unbalanced, an LiB provision might allow the lender to place the loan into default status. Banks and credit unions are the primary sources of commercial construction loans. They typically offer the best interest rates but also have some of the most stringent underwriting standards. Other sources include private lenders, the commercial mortgage-backed securities market, and life insurance companies. The Small Business Administration’s CDC/SBA 504 loan program is available for the construction of owner-occupied commercial real estate. The loan amounts can reach $14 million, with interest rates around 5% and terms from 10 to 20 years. For market intelligence and reports, check out the Commercial Construction – US Market Report from IBIS World or the Commercial Construction Index from the US Chamber of Commerce. There are several high-quality blogs providing news and information for those involved in commercial construction, including AEC Business, CC&R Magazine, and Construction Executive. Best Practices Construction Law is an excellent resource for understanding commercial construction litigation and legality issues. The Commercial Construction Loan Calculator provides a complete breakdown for the repayment process. You can count on Assets America® for all your commercial financing, including commercial construction, bridge loans, mini-perm loans and takeout loans. For the highest level of continuity, we can arrange the sequence from commercial construction loan to mini-perm loan to takeout loan. You will find that Assets America®, one of the most professional and diligent construction loan lenders in the marketplace, has the specialized knowledge and technical skills required to assemble your detailed commercial property loan documentation and to fund and secure exceptional commercial real estate loans. Whether you are interested in multifamily development, mixed use development, hospital building, industrial construction, hotel construction, or any other commercial building loan, we are one of the finest choices you could possibly make for successfully closing your construction loan. To arrange for your commercial construction loan starting at $5 million, contact us today at (206) 622-3000!